In my previous study on Marvel comics, I discussed the character the Red Skull, the WWII-era Nazi villain resurrected in the modern age, to battle his old foe, the racial liberal Captain America. The same writer, Greg Pak, who put together a series on the background of Jewish Holocaust survivor Magneto, now wants to write about the villains of that era, rather than the victims. Hence, the Red Skull Incarnate series, attempting to explain how the Skull’s “evil” came to be.
. . . I’d struggled to understand how a nation often described as the most cultured in Europe could descend into the unfathomable barbarism of the Nazi regime. Never fear! Pak has done his research. Included in his reading are: The Coming of the Third Reich by Richard J. Evans, The Nazis: a Warning from History by Laurence Rees, Why They Kill by Richard Rhodes (this book is about serial killers and “other habitually violent people” – Pak equating the Nazis with sociopathic killers), and Explaining Hitler by an obviously unbiased author named Ron Rosenbaum. For some reason, Kevin MacDonald’s Separation and Its Discontents never made it to Pak’s reading list. Issue one of this series details the life of young Johann Schmidt (the future Red Skull), whose mother died in childbirth, and who finds himself in “the Munich Home for Wayward Boys.” This school is headed by a viciously abusive, sadistic director who is, of course, pro-Nazi (equating unpleasant personality types with “anti-Semitic racist hate”). Issue one takes place in November 1923 and covers the Beer Hall Putsch, during which, when the police fire on the Nazi marchers, young Johann makes his escape from the abusive Nazi. Issue two, several years later, shows Schmidt living on the street, harassed by young thugs, and taken in by a kindly Jew and his daughter, both refined and intelligent and tormented by stupid, violent Nazi Stormtroopers. The Nazis are shown as cowards who get beaten in street battles by the communist Red Front (obviously heroes here! ), while picking on defenseless Jews. Interesting, Pak depicts the Nazis as being protected from the Red Front by the police – the same police who fired on the Nazis in issue one. Issue three begins with the Nazis having come to power in early 1933. Young Johann, working for a crime boss, coldly murders a corrupt Nazi on behalf of his employer. Johann then comes across one of the youths, named “Dieter,” from the “home for boys.” Dieter is now a heroic anti-Nazi communist fighter, and Johann defends this young noble Red from more crude Nazi thugs. Indeed, this issue contrasts idealistic and heroic communist youth against the subhuman Nazi criminals, and, also, complains that Nazi electoral success vs. the communists, after Hitler’s accession to power, was unfairly aided by the Nazi tactic of having many communist leaders imprisoned. Now, given that the communists were the greatest mass murderers in history, you’d think that Pak (and Marvel generally) would be a bit more circumspect, and at least treat both the Nazis and the Reds as equally villainous. But, no. As Steve Sailer would tell us, it is all about the questions of “Who?” and “Whom?” The Nazis are infamous for persecuting a very special minority group, while the communists merely murdered countless millions of Slavs (and Chinese, Cambodians, etc.) – and who cares about that? At the end of issue three, young Johann, wanting to be on the winning side, throws his lot in with the Nazis, well on the road to being the Red Skull, the living embodiment of evil. After all, had Johann remained a communist, if he had migrated to the USSR and joined the Levantine NKVD leadership in killing Russians and mass-starving Ukrainians, he’d instead have been a hero indeed! Issue four sees Johann as a member of the SA, embittered, as are the other SA men, at the rise of the SS, and the Stormtroopers’ increasing irrelevance in the young Nazi regime. Johann is also angry that his SA officer beats him, and when the future Red Skull is mocked by the SS when he tries to join them, he’s ready to rebel against the evil Nazis. Who to team up with? The noble communists of course! The young communist Dieter, released from Dachau, meets Johann and by the end of issue four they concoct a plan to assassinate Hitler. My, my . . . is there still hope for Johann Schmidt to be a hero in Greg Pak’s eyes? From a comic fan’s point of view, this series was of low quality, with mediocre art and juvenile writing. From a political and historical standpoint, reading this series, one would never have guessed that Hitler came to power legally, and that his regime had the broad support of the majority of the German people. The fact that the greatest mass murderers and totalitarian thugs in history were the “heroic” communists is also something one can not derive from Pak’s work. This shows the validity of Steve Sailer’s emphasis on “Who? Whom?” questions. After all, the Nazis persecuted Jews, so the Nazis are the epitome of evil. Jews were overrepresented in the ranks of the communists, in both Germany and the Soviet Union, so the communists are the heroes of this little tale, all thoughts of objective balance disregarded. And who were the major victims of European communism? Just Russians and Ukrainians, and we know that they were “anti-Semites” as well. Those dumb Slavs just got what was coming to them! “Who? Whom?” indeed. Thus, we have the birth of the Nazi Red Skull, Marvel Comics’ version of the very incarnation of evil, to contrast to the noble victims of such evil. This is typical of Marvel’s racial liberalism, and their Manichean view of history in which “Nazis, racists, and the intolerant” are beyond the pale of acceptance, while multiracialist multiculturalism, as part of constitutional patriotism, is what we should strive for. No doubt, Marvel would consider us to be the real-life representatives of evil. Meanwhile, mass-murdering totalitarian communists are good and noble, as pure as freshly fallen snow. What are countless millions of dead Slavs to the good and morale folks over at Marvel Comics? Is Marvel full of apologists for communist mass murder? For Ukrainian genocide? For the destruction of millions of Slavs and for the decades-long enslavement of Eastern Europe? Who? Whom? Therefore, one can conclude that good and evil, like beauty, is in the eye of the beholder. Published: June 28, 2012 | This entry was posted in North American New Right and tagged articles, Communism, graphic novels and comics, Greg Pak, Marvel Comics, National Socialism, North American New Right, originals, Red Skull, Ted Sallis, the Jewish question, World War II. Both comments and trackbacks are currently closed. I don’t see collaboration between two different European ethnic groups — each with its own history, culture, and will to survive — as a “bourgeois compromise”. Each of the distinct peoples of Europe, Nordic or otherwise, aught to have its own living space where its unique identity and culture predominates. And each people also aught to defend Europe as a land free from settlement by non-Europeans, and support the efforts of the others to suppress non-European immigration. Ted Sallis’ previous piece, Pan-European Preservationism, addresses this question well. Infighting is ultimately self-destructive, as is the assertion that one group is the “master race”, inherently superior to the others. Just as individual self-assertion and self-confidence are healthy while arrogance and narcissism are destructive, so also ethnic and racial self-assertion are healthy provided they don’t cross the line into ethnic and racial arrogance. Captain America was created by two jews in the 1940s to start a anti-German histeria. Both the big comic-book companies (DC and Marvel) are largely Jewish-run, so it shouldn’t come as a surprise that Jews write a version of history with their own Semitic bias. If it’s bad for the Jews, then it’s bad for us all (and the ultimate evil in the universe). 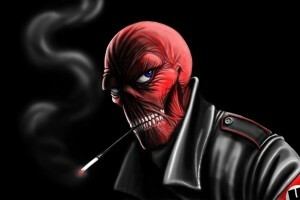 The Red Skull isn’t the first comic-book villain who embodies the “Nazi archetype”, and neither will he be the last. This pathological Nazi-obsession by the Jews is pretty remarkable – it’s almost like a religion where Jews are a race of gods and Hitler is the Satan figure. Pretty bizarre. This Jewish bias in everything doesn’t extent only to history-based comics, it’s all over Marvel’s superhero comics. I used to read Spiderman as a kid, and only now did I notice that the bookish, intelligent, thin, bespectacled Peter Parker is very “implicitly Jewish” – in contrast to the ham-fisted, ham-hearted Flash, the blond bully who is obviously a stereotypical goy. In fact, it’s hard to think of any Marvel comic without Jewish involvement of some sort. For Ukrainian genocide? For the destruction of millions of Slavs and for the decades-long enslavement of Eastern Europe? This is typical of Marvel’s racial liberalism, and their Manichean view of history in which “Nazis, racists, and the intolerant” are beyond the pale of acceptance, while multiracialist multiculturalism, as part of constitutional patriotism, is what we should strive for. LOL, yes, it’s pretty funny how Marvel and DC have taken the stance that multiracial “culture patriotism” is the best thing in the universe. “The American Way”, as they call it. It’s all very neocon-ish. Actually, it IS a religion. Pretty standard Judaism, post-exillic, the sort they don’t let the goyim learn about, subsituting Fiddler on the Roof nonsense and ACLU type “morality”. “Our race is the Master Race. We are divine gods on this planet. We are as different from the inferior races as they are from insects. In fact, compared to our race, other races are beasts and animals, cattle at best. Our destiny is to rule over the inferior races. Our earthly kingdom will be ruled by our leader with a rod of iron. The masses will lick our feet and serve us as our slaves.” — Israeli Prime Minister Menachem Begin in a speech to the Knesset [Israeli Parlament], quoted by Amnon Kapeliouk (Jewish), “Begin and the Beasts,” New Statesman, June 25, 1982. Yeah, one of Der Fuhrer’s many screw-ups. Substituting linguistic nationalism for race. Somehow the Japanese were OK but the Slav had to be enslaved. He otherwise would have been able to count on being welcomed as a liberator by the Slavs, even the Russians. Instead, Stalin turned it into the Great Patriotic War. On the other hand, it did lead to Soviet Communism being reconfigured as Russian nationalism, leading to Stalin’s “anti-Semitic” turn, and making the Soviet Union the real hope of the White race, vs. the US, according to Yockey. Yeah, one of Der Fuhrer’s many screw-ups. Substituting linguistic nationalism for race. Somehow the Japanese were OK but the Slav had to be enslaved. To me, it seems Hitler’s hatred for Slavs was a bizarre mixture of racial and cultural nationalism. It’s pretty understandable why they fought so hard against the Germans (compare with Western Europe, where it wasn’t as bad). Hitler’s weird Japanophilia also sticks out – I remember reading a quote of his that he cheered for Japan in the Russo-Japanese War as a kid.